How easy is it to relax and enjoy yourself when you’re in a state of fear and unrest about anything in your life? Not very easy at all! There’s a direct link between your level of confidence on a day to day basis and the quality of your life. Specific to money, which is the means with which we all support our desired lifestyle, developing and maintaining supreme financial confidence is more necessary and critical today than ever before. Without it, you will continue to pull your punches, and miss out on living the life and enjoying the experiences you could and should due to fear. Have you ever stopped to think about why there is such a low level of financial confidence today? Well, as you heard me recently mention to William Shatner and Doug Llewelyn on Moving America Forward, there’s no long history, and very few good examples of individuals who have reached and maintained financial independence over a long life. You have to remember that, for anyone other than the super wealthy like the Carnegies and the Rockefellers of the world, the whole concept of retirement, or being able to financially support yourself without having to work, has only been around for about 75 years. Stop and think about that for a moment. Historically speaking, that’s not a very long time. Before that, “retirement” didn’t exist. People worked until they passed away. Or, they lived with, and were supported by, their family. What initially changed all of that was social security and fixed monthly pensions provided by lifetime employers. It was a lot easier for most because you could add up the amount you’d receive each month from social security and your pension, and if it was more than you needed to live on, you could make the determination if you’d be okay or not and feel confident about it. However, over the last 30 years or so, that has all changed. Fixed pensions are becoming a thing of the past for most Americans. Instead, employer sponsored “savings” plans, such as 401(k)s and 403(b)s have taken center stage as employers have removed themselves from the financial management business. At retirement, you’re no longer ‘guaranteed’ a monthly pension. a) First, is it enough to provide the lifestyle sustaining income I’ll need given inflation? b) And, second, how do I avoid all of the potential mistakes, and take advantage of the opportunities necessary for me to earn what I need in order to make my money last longer than I do? In a nutshell, at the stage in your life where there’s no room for big mistakes, the responsibility for your financial independence and security has been transferred from your employer to you. Generating consistent, inflation adjusted cash flow….navigating ever changing tax laws…managing investments and dealing with volatile financial markets….protecting your income and assets for your family….planning your estate. It’s now all on you. And, on top of it all, you are pounded on a moment by moment basis through various media outlets tugging at your attention with conflicting and confusing information. There’s no mystery why there is such a lack of financial confidence out there, especially during your retirement years! 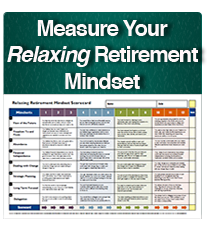 As we begin the New Year, I believe it’s critically important for you to review and implement the fundamentals and principles of what a Relaxing Retirement entails. That begins by taking a giant step back and accurately assessing what the fundamental challenges and obstacles are that you’re dealing with. The focus of many of the individuals who I meet with for the first time is often in many different directions. My recommendation is always to have them clearly identify the lifestyle they want, and then the challenges and obstacles they face in getting there. This may all seem obvious, but most people who I meet with for the first time have no idea why they’re even investing in the first place, nor why they’re allocated the way they are. In most cases, the reason they’re allocated the way they are is because Fund X seemed like a good fund, or recently performed well! Extremely dangerous in its simplicity! If you don’t begin by first identifying all the potential obstacles in your way to enjoying a Relaxing Retirement, you will join the overwhelming majority of Americans who tend to wander and focus on things that are potentially important, but completely out of context and inappropriate for their unique situation and circumstances.